Calm winds have helped California firefighters make progress battling a massive blaze in Ventura and Santa Barbara counties, but the fire is expected to eclipse the largest wildfire in recorded state history, officials said. "We've had a very productive day again. 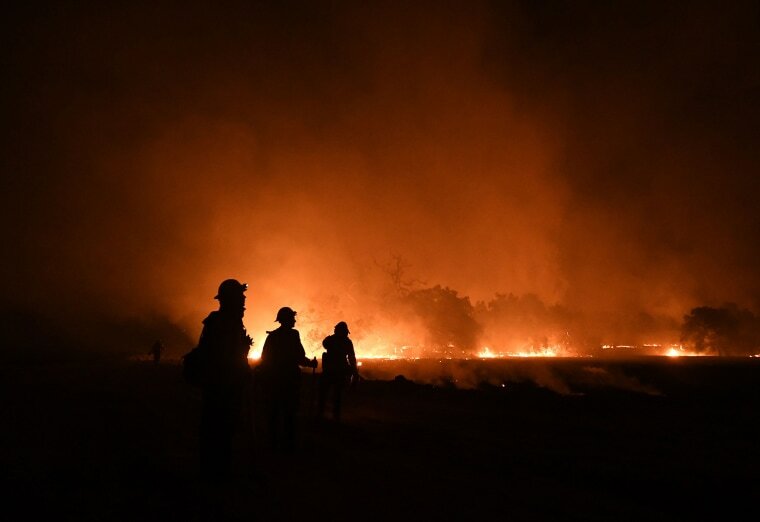 It’s nice having a couple days in a row where we have good progress," Deputy Chief Mark Brown of the California Department of Forestry and Fire Protection, known as Cal Fire, said Monday night. The so-called Thomas fire has burned burned around 272,000 acres since it broke out on the evening of Dec. 4. A respite from powerful winds allowed firefighters to reach 50 percent containment on the fire, and crews were taking advantage of calm conditions Tuesday by performing a controlled burn to remove swaths of dry brush along the fire's northern edge. "We're going to take a lot of that fuel out of there," said Capt. Rick Crawford, a spokesman for Cal Fire. "That way when the winds come back there'll be nothing left to burn." The Thomas Fire has destroyed over 1,000 structures, including at least 765 homes, and been blamed for at least two deaths, including a woman killed in a crash while evacuating and a firefighter who died while fighting the blaze, officials said. The largest fire in recorded state history is 2003's Cedar fire, which burned 273,246 acres in San Diego County, killed 15 people and destroyed over 2,800 structures. Brown said Monday that he expects the Thomas Fire to grow larger than that fire. "Do we think it’s going to get bigger than the Cedar fire? With the planned containment lines for the firing operation that we have going on, yeah," said Brown. The size of the Thomas fire eclipsed the California portion of the second-largest fire recorded in the state, the so-called Rush fire which burned in Lassen County in northeast California on the Nevada border in August 2012, according to Cal Fire records. That fire burned 271,911 acres in California and another 43,666 acres in Nevada, but no structures were destroyed and there were no deaths. The Thomas fire's growth has been fueled by Santa Ana winds. Westerly winds have brought cooler temperatures and increased humidity across the fire area in the last couple of days, but a cold front is expected to bring gusty northerly winds to the fire zone Wednesday night and into Thursday morning, National Weather Service incident meteorologist Rich Thompson said. The weather service has put in place a fire weather watch for the Santa Barbara mountains and the south coast of Santa Barbara County from 6 p.m. Wednesday to 10 a.m. Thursday, Thompson said. Winds could gust 35 to 50 miles per hour, he said. Also Tuesday, some evacuation orders were lifted in the Thomas fire. The Santa Barbara County Sheriff’s Office said evacuation orders for some homes north of Highway 192 have been changed to an evacuation warning. More than 6,800 firefighters were battling the Thomas Fire as of Tuesday evening, according to Cal Fire. Fire departments from 10 Western states, as far away as Alaska, were sent to help. The Ventura County Fire Department said on Twitter Monday that some fire crews were being released to their departments. Todd Durham, incident commander for Cal Fire team 4, thanked the community for their support of firefighters, but said that the focus should be on survivors of the blaze. "The response from the community actually to the firefighters and law enforcement agencies has been extremely gracious,” Durham said during a Monday night news conference. “But we would like to ask that you join us in focusing your efforts towards the fire survivors, to your community, the people that are out there," he said. The Thomas fire and other fires that broke out in Southern California amid the Santa Ana winds erupted just months after a series of large wildfires in Northern California destroyed more than 8,000 structures and left over 40 people dead.